Our conference room is approx. 37qm large and can be occupied by up to 20 people. The conference room has daylight and is equipped with a screen, beamer and flipchart. You have the possibility to book the conference room with or without catering. You can find the prices in the conference package. You have the possibility to rent our business room as a small meeting room. The conference room is approx. 16 sqm and can be occupied by 2 to max. 4 people. The business room is equipped with two PC´s, printer and office utensils. You have the possibility to book the conference room with or without catering. The room is rented without technical equipment. You can find the prices in the conference flat rate. 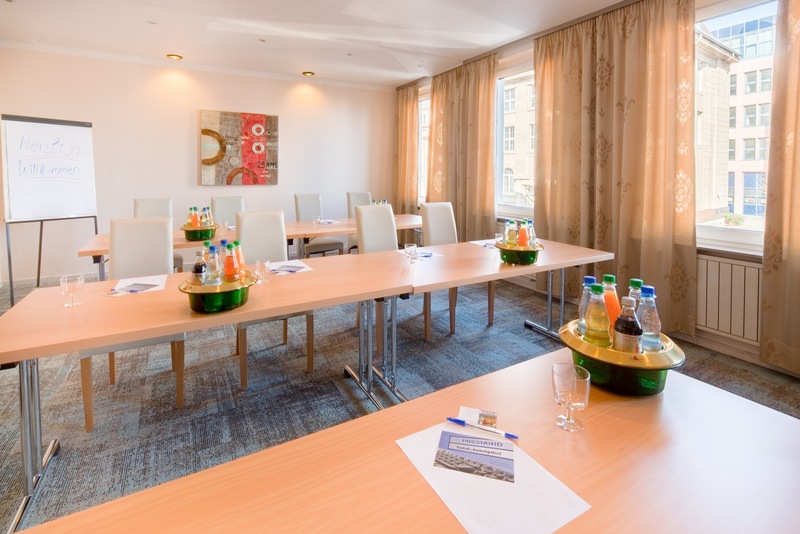 The use of the conference room in connection with hotel room bookings is free of charge for all hotel guests. Foreign conference guests have to pay a fee. Package 1: Mineral water & apple juice, coffee break with fruit & pastries in the morning, sandwiches for lunch, coffee break with biscuits in the afternoon. All packages are exclusive room rentals. Yes, I agree that a non-binding offer will be sent to me by e-mail.